The entire setup process is very straight forward, however, once you get to the actual install it will ask for gcc location (not installed by default) and your kernel-header location (also not installed by default). While gcc was a very easy install, the kernel headers took a little bit of research. 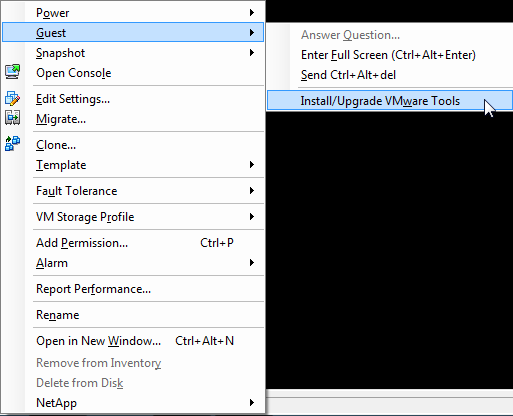 Begin by turning on the VM (virtual machine) that you intend on installing VMware Tools onto. Once the machine is booted, right click on the VM's name in the console, then under the guest submenu, select "Install/Upgrade VMware Tools"; this will mount a cd to /dev/cdrom. This CD will be mounted read-only so you will have to mount the CD, copy the contents to a different location (we will be using the /tmp directory) and complete the installation from the new directory. Before we are able to mount the CD we need to create a mount point which will be in /mnt. Once you have created a mount point, go ahead and mount the CD to this folder. Navigate into the mounted directory and copy the tar ball into /tmp then extract. Because the drive is write-protected and mounted as read-only you cannot extract the tarball on the drive (or in the folder we mounted to) and it needs to be done in a different location. Once you have successfully extracted the installer, navigate into the new folder created, vmware-tools-distrib. In here you will see quite a few files, however you only need to run vmware-install.pl. Here is where the installation differs from the documentation. Try to run the vmware-install.pl, if it fails it will remove itself when you run the command again (it will detect a previous install and remove it), however if it runs and does not have any errors, you're done! Accept all of the default locations until it asks for your gcc location. If the gcc location is specified as "" this needs to be installed to continue, however this one is very easy. Try running vmware-install.pl and it should go through the gcc part smoothly now, however the next part will ask for your kernel-headers, and again like gcc if it states the location is "", you will need to install these. After quite a bit of research I finally found an answer to how to easily install these, and it is quite simple once I figured it out, just run the following command and you'll be ready to run the install script one last time. Run vmware-install.pl one last time and you should see it sucessfully install! Once you are finished with the install you need to kick start the process to get it initially running. If this command returns an error, just log out of your server and re-login and the service will be started. To verify this worked try ps aux | less to find the service name.